This is a Beta release of Stackdriver endorsement of OpenCensus. This feature is not covered by any SLA or deprecation policy and might be subject to backward-incompatible changes. Stackdriver Monitoring automatically collects more than a thousand built-in metrics from a lengthy list of monitored resources. But those metrics cannot capture application-specific data or client-side system data. Those metrics can give you information on backend latency or disk usage, but they can't tell you how many background routines your applicaton spawned. Application-specific metrics are metrics that you define and collect to capture information the built-in Stackdriver Monitoring metrics cannot. You capture such metrics by using an API provided by a library to instrument your code, and then you send the metrics to a backend application like Stackdriver Monitoring. In Stackdriver Monitoring, application-specific metrics are typically called “custom metrics”. The terms are interchangeable. They are also called “user-defined metrics”. As far as Stackdriver Monitoring is concerned, custom metrics can be used like the built-in metrics. You can chart them, set alerts on them, and otherwise monitor them. The difference is that you define the metrics, write data to them, and can delete them. You can't do any of that with the built-in metrics. There are many ways to capture custom metrics, including using the native Stackdriver Monitoring API. Stackdriver recommends that you use OpenCensus to instrument your code for collecting custom metrics. Provide vendor-agnostic support for the collection of metric and trace data across a variety of languages. Can export the collected data to a variety of backend applications, including Stackdriver. For the current list of supported languages, see Language Support. For the current list of backend applications for which exporters are available, see Exporters. Although Stackdriver Monitoring provides an API that supports defining and collecting custom metrics, it is a low-level, proprietary API. OpenCensus provides a much more idiomatic API, along with an exporter that sends your metric data to Stackdriver Monitoring through the Monitoring API for you. Additionally, OpenCensus is an open-source project. You can export the collected data using a vendor-agnostic library rather than a proprietary library. OpenCensus also has good support for application tracing; see OpenCensus Tracing for a general overview. Stackdriver recommends using OpenCensus for trace instrumentation. You can use a single distribution of libraries to collect both metric and trace data from your services. For information about using OpenCensus with Stackdriver Trace, see Client Libraries for Trace. To use Stackdriver Monitoring, you must have a GCP project with billing enabled. The project must also be associated with a Stackdriver Workspace. 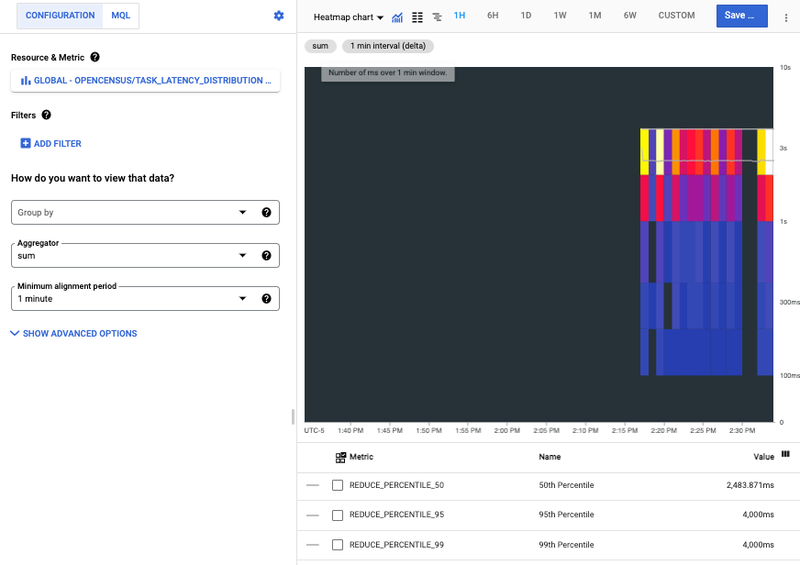 Stackdriver Monitoring uses Workspaces to organize monitored GCP projects. To associate your project with a Workspace, see Workspaces. Custom metrics are a chargeable feature of Stackdriver Monitoring, so there could be costs associated with the ingestion of your metrics. For more information on pricing, see Stackdriver Pricing. To use OpenCensus, you must make the metrics libraries, and the Stackdriver exporter, available. Using OpenCensus requires Go version 1.11 or higher. The dependencies are handled automatically for you. Before installing the OpenCensus core and exporter libraries, make sure you've prepared your environment for Node.js development. Importing the OpenCensus stats and OpenCensus Stackdriver exporter packages. Using the OpenCensus API to instrument your code. // The task latency in milliseconds. // otherwise recorded metrics will be dropped and never exported. // Exporters use Application Default Credentials to authenticate. // Flush must be called before main() exits to ensure metrics are recorded. // Record 100 fake latency values between 0 and 5 seconds. // Enable OpenCensus exporters to export metrics to Stackdriver Monitoring. // lost if they are recorded after the last export. // Exporters use Application Default Credentials (ADCs) to authenticate. // The minimum reporting period for Stackdriver is 1 minute. * after the last export. When this metric data is exported to Stackdriver, you can use it like any other data. The program creates an OpenCensus view called task_latency_distribution. This string becomes part of the name of the metric when it is exported to Stackdriver Monitoring. See Retrieving metric descriptors to see how the OpenCensus view is realized as a Stackdriver Monitoring metric descriptor. Each bar in the heatmap represents one run of the program, and the colored components of each bar represent buckets in the latency distribution. See OpenCensus metrics in Stackdriver for more details about the data behind the chart. The native Stackdriver Monitoring API for custom metrics is supported; using it is described in Using Custom Metrics. In fact, the OpenCensus exporter for Stackdriver uses this API for you. Even if you don't need to know the specifics of using the Stackdriver Monitoring API, familiarity with its constructs and terminology is useful for understanding how Stackdriver Monitoring represents the metrics. This section provides some of that background. Once your metrics are ingested into Stackdriver, they are stored within Stackdriver Monitoring constructs. You can, for example, retrieve the metric descriptor — a type from the Monitoring API — of a custom metric. See MetricDescriptor for more information. You encounter these metric descriptors, for example, when creating charts for your data. The constructs used by the OpenCensus API differ from those used by Stackdriver Monitoring, as does some use of terminology. Where Stackdriver Monitoring refers to “metrics”, OpenCensus sometimes refers to “stats”. For example, the component of OpenCensus that sends metric data in Stackdriver is called the “stats exporter for Stackdriver”. See OpenCensus Metrics for an overview of the OpenCensus model for metrics. The data models for OpenCensus stats and Stackdriver Monitoring metrics do not fall into a neat 1:1 mapping. Many of the same concepts exist in each, but they are not directly interchangeable. An OpenCensus view is generally analogous to the MetricDescriptor in the Monitoring API. A view describes how to collect and aggregate individual measurements. All recorded measurements are broken down by tags. An OpenCensus measure describes metric data to be recorded. An OpenCensus aggregation is a function applied to data used to summarize it. These are used in exporting to determine the MetricKind, ValueType, and unit reported in the Stackdriver metric descriptor. An OpenCensus measurement is a data point collected for measure. Measurements must be aggregated into views. Otherwise, the individual measurements are dropped. This construct is analogous to a Point in the Monitoring API. When measurements are aggregated in views, the aggregated data is stored as view data, analogous to a TimeSeries in the Monitoring API. You can supply the name of the OpenCensus view when specifying the metric to restrict the search. See Selecting metrics for more information. You can retrieve the metric data using the Monitoring API directly. To retrieve the metric data, you need to know the Stackdriver names to which the OpenCensus metrics were exported. One way to get this information is to retrieve the metric descriptors that were created by the exporter and find the value of the type field. This value incorporates the name of the OpenCensus view from which it was exported. For details on metric descriptors, see MetricDescriptor. Enter the name of your project in the name field: projects/[PROJECT_ID] This document uses a project with the ID a-gcp-project. There are a lot of metric descriptors in any project. Filtering on a substring from the OpenCensus view's name eliminates most of them. With this information, you can then manually retrieve the data associated with this metric type. This is also the data that appears on a chart for this metric. Enter a filter in the filter field for the desired metric type: metric.type="custom.googleapis.com/opencensus/task_latency_distribution"
The key, metric.type, is a field in a type embedded in a timeseries. See TimeSeries for details. The value is the type value extracted from the metric descriptor in Retrieving metric descriptors. Information about the monitored resource on which the data was collected. OpenCensus can automatically detect gce_instance, k8s_container, and aws_ec2_instance monitored resources. This data came from a program run on a Compute Engine instance. For information on using other monitored resources, see Set monitored resource for exporter. Description of the kind of metric and the type of the values. The actual data points collected within the time interval requested.